help in locating him. Justin currently has two outstanding warrants for his arrest: one felony arrest warrant out of San Jose Police and a felony parole violation warrant. Justin Johnson is 25 years old, 5’10” tall, 210 pounds, with brown hair and hazel eyes. 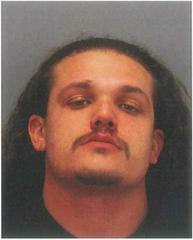 If you know where Justin Johnson is, please contact the Sheriff’s Office immediately at 408-299-2311 or 9-1-1.